The bachelor of arts in arts management (BAAM) major allows students to study the issues, problems and policy interventions impacting contemporary arts and cultural industries, develop business and managerial skills for professional decision-making in arts and cultural organizations and practice creative and critical thinking, opportunity recognition and entrepreneurship in arts and cultural environments. Students will understand the professional role and responsibilities of successful creative individuals in contemporary society. The Department of Arts Administration, Education and Policy faculty are leaders in the arts, arts policy and administration and their alumni work all over the world in arts-related careers. Students may seek employment in public or nonprofit arts councils, arts agencies and advocacy groups at the local, state, regional or national level. Because of the emphasis on public policy, students may transfer their skills to other nonprofit or community service organizations outside of the arts. The arts entrepreneurship minor allows students to develop entrepreneurial and managerial skills necessary to succeed as creative individuals in the increasingly complex economic environment of contemporary art-making. Have a question about Arts Management or want more information? Let us know. Andy Meyer, a fourth-year student from Westerville, Ohio, is majoring in arts management with a minor in printmaking. Meyer is a student assistant at The Arts Initiative in the College of Arts and Sciences. Part of the initiative includes an on-campus gallery, Hopkins Hall Gallery, and a downtown 10,000 square foot exhibition and alternative performance space, Urban Arts Space. It also serves as a professional launching pad for Ohio State students. "I’ve learned how to give a tour, which has tremendously helped my public speaking skills. I’ve gained solid communication skills and even some teaching skills. I am continuing to learn all about the art culture at Ohio State, but I’ve also have gotten experience with some manual labor such as installing artwork and drywall," said Meyer. Students will acquire skills in marketing, development, finance as well as organizational leadership. These skills allow students to work in arts and cultural institutions of various sizes and diverse missions. Or, students will seek the major to complement a performance or production career within their respective arts industry. Because of their management-related skills students are prepared to work collaboratively with other artists in entrepreneurial or for-profit arts organizations. While the needs of the field and its organizations are specific, the arts management major emphasizes the importance of interdisciplinary study blending concepts and skills from multiple arts disciplines, public policy environments, and management operations. The BA in Arts Management prepares students to work in community-based arts and nonprofit cultural institutions, public arts agencies, and commercial arts businesses. Students are introduced to the current policies, issues and topics relating to creative enterprises. Students learn about the organizational structures in non-profit arts organizations, applying management skills to enact balance and stability. 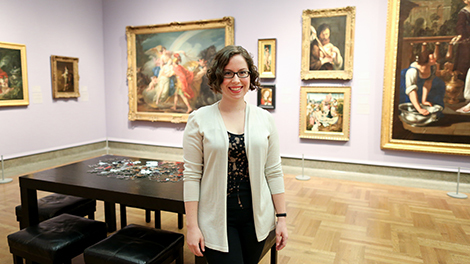 There are robust internship opportunities for Arts Management majors. Using both the community partners and vast alumni connections, the department is able to assist students in locating internships in their area of interest. Many graduates have been hired by the company or organization hosting the intern. Student-run organization for Arts Management majors. Organizes guest lectures, field-trips, and other activities for undergraduates in arts management. The Lawrence and Isabel Barnett Center for Integrated Arts and Enterprise educates and prepares students for successful careers in the arts and related entrepreneurial fields. The Center advances and increases students’ understandings of the business side of the arts and the worlds of arts management, policy, and culture by focusing on the entrepreneurial aspects of the arts. Department led study abroad trips offer students opportunities to engage with arts and cultural activities in Chile, Jamaica, and Ireland. Faculty and students immerse themselves in local culture, historic sites, and learn to bridge course concepts within a global framework.